Empowered once again by the presence of my wallet, I have been able to watch the Japanese Yen do many fantastic tricks for me. I still don’t understand the subtle, dexterous finger movements of Japanese store clerks as they count back yen bills, but I do know how to spend them. 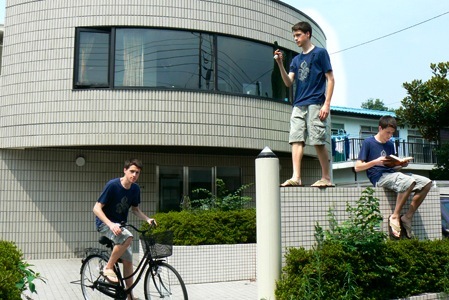 This knowledge has taken me an appreciable distance into the curiosities of Japan that easily catch the attention of a foreigner like myself. Although there is still much left undiscovered, I have been quite entertained by what a little digging has revealed so far. 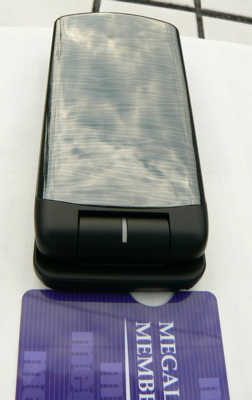 Of immediate interest is the Japanese cell phone. I had known that they are generally more advanced than those sold in the U.S.—except perhaps for the iPhone, which was released after I left—but just one peak into an electronics store gave me a surprise. I cannot tell you how many different models of cell phones are available here because it would take me too long to count them all. When I saw them lined up along store shelves for the first time, the photo-op* light in my head shone brightly because I had never seen anything like it. But I was dismayed to find that photography was not allowed there. The people back home were just going to have to believe me with reduced interest. Recommended method for viewing: Right-click this link and select to download it. Before playing the downloaded file, make sure that it ends in .mov. but you’ll still see plenty in it. Note that I took this video in a store near my dorm, which is smaller and has a less impressive lineup than bigger stores in flashier areas. (It made the video easier to film, though.) The link is to the left. There is a reason why so many different models have been produced: Cell phones are extremely popular here, much like shoes in the U.S. 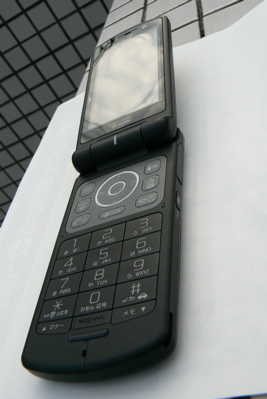 I imagine that it would be difficult to find a Japanese person past primary school who does not carry a cell phone. There’s a term for this in Japanese: keitai izon-shō (携帯依存症), which literally means “cell phone dependence syndrome.” It refers also to the constant attention that cell phones get from their masters. In a way it’s an overemphasis to have “phone” in the device’s name because making calls isn’t exactly their main use or purpose. What I see around me even more is typing, reading, taking pictures, listening to music, watching TV, checking the weather, surfing the Internet, making reservations (via the screen), and I don’t know what else. What I see may be somewhat disproportionate, though, because talking on cell phones is prohibited on public transportation. On my train rides every day, a good 30–40% of people around me are madly typing away, while roughly another half is sleeping. An elderly, gray-haired person is equally likely to be engaged in either activity. The remainder settles with reading ancient printed materials, listening to iPods, or playing Nintendo and Sony’s handheld video game systems. Sometimes people talk to each other, but especially earlier in the day, the only audible sounds tend to be the tracks’ clickety-clacks, announcements of the next stop, and buffeting air from really fast trains going the other direction insanely close by. If the current weather were really displayed in this manner, then I think I’d suddenly give into keitai izon-shō myself. When I went into a store to buy a phone, I was immediately overwhelmed by all of the choices available. Even after I was limited to the cheapest models, there were still at least 20 to choose from. 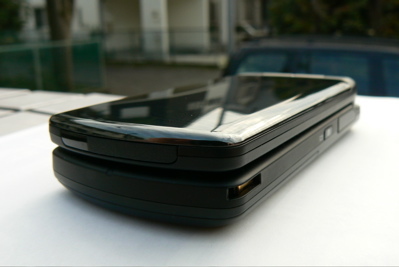 Rather than comparing how cool each of them looked or caring about what features were packed into the plastic, I just went for the smallest, slimmest designs that would slip easily into my pocket. There were three, and with much greater ease I selected one: the Sony SO703i. It had multiple color and face options, of course—got to be able chose whether I want a white, black, or gold casing. I mean, c’mon. It’s like a basic right. It turns out that I went a bit crazy in taking pictures of this thing. I’ll share a conservative number of photos, but you may still want to skip ahead if shiny gadgets bore you easily. 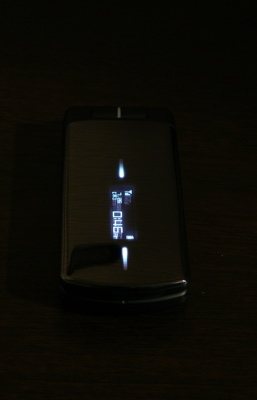 There’s an infrared transmitter/receiver on the top of the flip. 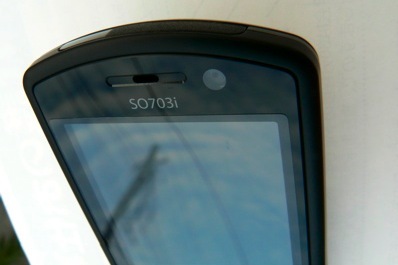 Yes, it has a 2-megapixel camera with a macro switch on the back, but that’s standard. 5 megapixels is the highest I’ve seen so far. 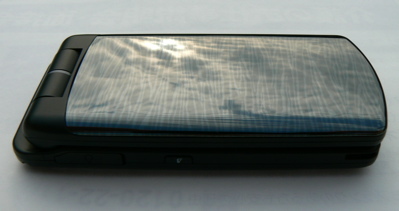 Sample pictures: tiny, screen size, and largest. Flip phones are the most popular style by far. Notice that there are not two but four soft keys (or menu keys). 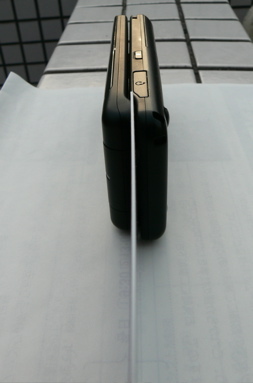 The secondary, internal camera is also standard. 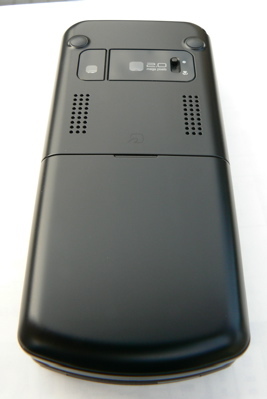 It can take pictures, but it’s purpose is to add TV phone functionality. 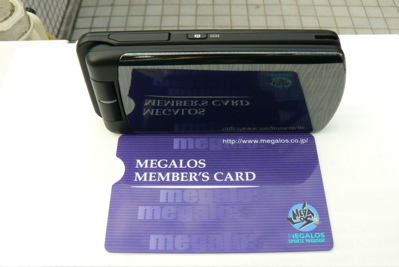 The screen is not quite as long as a credit card, which is understandable since I chose a compact model. Length comparison. Look below for more on Megalos. Ah, there’s an external screen after all! I must be a nerd. Although surely some of the people reading this are fascinated by what I’ve been sharing, I realize that I’ve gone too far in depth for the purposes of this blaug. My apologies for your boredom. 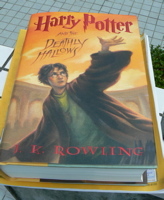 Something entirely less Japanese that additional yen bought me is a copy of Harry Potter and the Deathly Hallows. I had the option of traveling to one of Tokyo’s many large bookstores to pick it up, but I decided that Amazon Japan would be more convenient for my current situation. Boy, did that ever prove to be an understatement! I was at work when they delivery truck stopped by with Harry Potter, and a notice slip in my box is what I found when I came home. Thanks to the precision of time stamps in Japan, I know that the initial delivery attempt was 24 hours and 4 minutes after I ordered it. One day and four minutes! And that was with the free shipping option! Unbelievable. But it gets better—or worse if one considers convenience on this level to be borderline harmful. The barcodes are everywhere, such as on the wrapping of this pair of disposable chopsticks. Even the Amazon Japan box came with one. Web site designed for phones. That’s what I chose to do, and in no time I had requested the delivery truck to return to my place the next day between 8:00 and 9:00 p.m. And of course it did exactly that. The only relationship that my next purchase has to my cell phone is its color, so I think I can finally drop the call and move on. Whew . . . now it’s grandma time! My color options were silver and black. Why did I choose black? It’s hot here! I’m afraid that I don’t have an answer for this one. 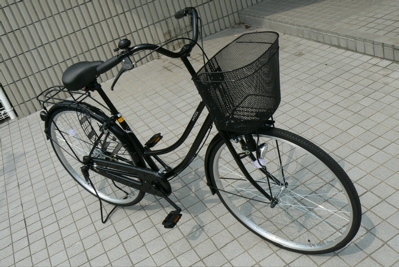 This is the quintessential bicycle in Japan. 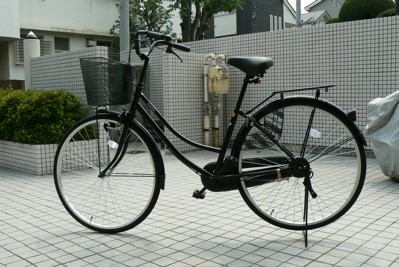 Nicer bikes are available, but they all cost a lot more than the roughly $85’s worth of yen that I paid. Riding it may not reach the level of fun that I’m used to, but it’s much more fun than walking. It’s also faster. And reasonably, that basket on the front becomes a trunk, making it possible to use this flailing heap of steel like a car. 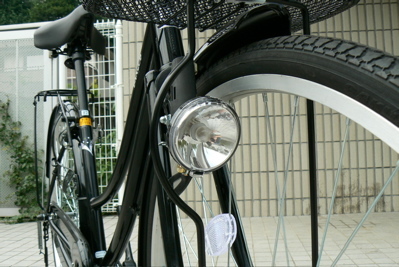 The headlamp is powered by the spinning front wheel. 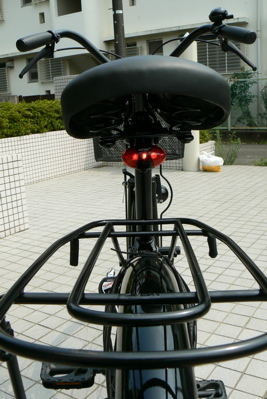 I bought an LED light for the back because I’ll be riding on the roads at night a lot. The essential, pre-installed lock. 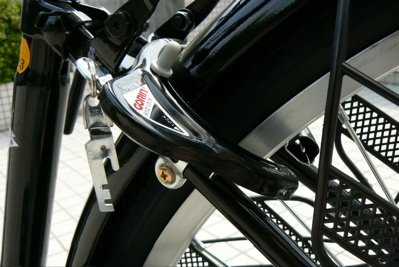 If I pull that handle down and remove the key, then my bike won’t be stolen. If I fail to do so, then it will be gone within five minutes (or so I’m told). What a kickstand! May the single-speed beast never fall. The hardest part for me: not enough distance between the seat and the pedals. And I even raised the seat higher than the guy at the bike store said I should. 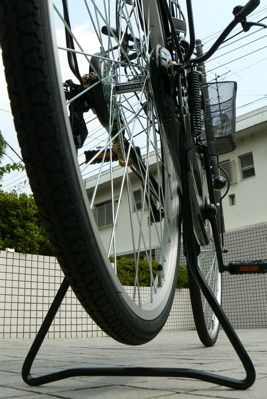 One of the main reasons I wanted a bike is that I got a membership at gym, and it’s a long walk from my dorm. It’s a great gym, though, so I wasn’t about to let the distance stop me. As you already know if you looked closely at the cell phone pictures, it’s called Megalos. That’s a weird name if you ask me, since no correlation is made between it and the words “mega loss,” which would have made some sense. 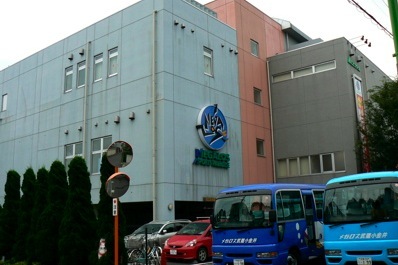 This place is tricky to photograph because it’s big, and one thing that Japan has very little of is open space for taking pictures of big things. Now with only the parking lot in the way. The only other note I’ll make about Megalos is that there is a tanning bed in the men’s locker room. I have never seen such a thing before. Surprised, I asked an employee about it later, and I received assurance that I’m allowed to use it whenever I want. I’m already getting burned enough by the hot sun here, but it’s nice to know that I can escape the shade indoors, too. 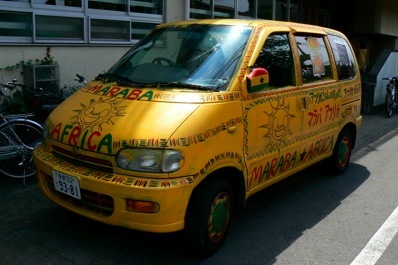 This van was parked in front of a nursery or school for young children. 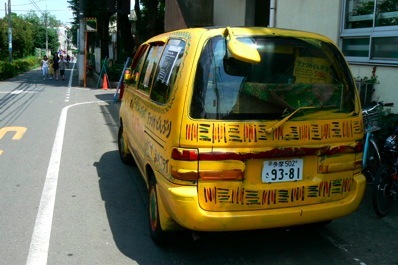 I could hear African-sounding drum beats issuing from inside. Uh, okay . . . The street to the left is the one down which I took you in my dorm tour video. 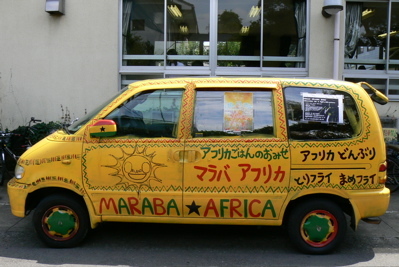 After musing over the Africa van, I proceeded to take some general pictures of Koganei. 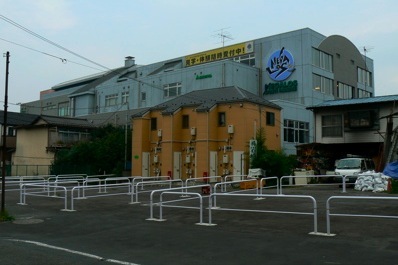 By now I have collected enough images of both Koganei (where I live) and Shiodome (where I work) that I can start a page of pictures for each. This lengthy entry is sufficient for now, though, so I’ll put those up at a later time. The wonder isn’t over yet. 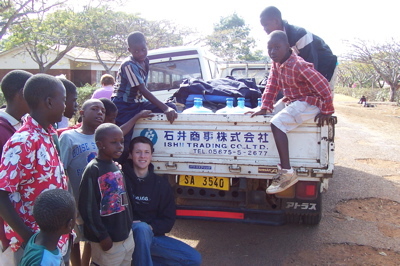 *The Japanese term that means “photo op,” or “photograph opportunity,” is shattā chansu (i.e. “shutter chance”). Another interesting point of comparison is text messaging. 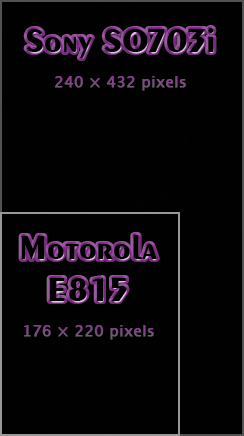 The Motorola’s standard text messages had a limit of 160 characters and cost 5¢ apiece to send or receive. 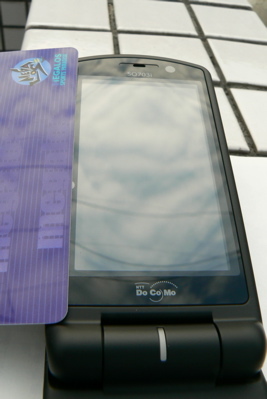 The Sony’s standard messages, however, can contain up to 10,000 characters and cost ¥1 (less than a penny) each.